Overnight oats are totally hot right now because they’re cool. In the summertime, if you’re anything like me, you don’t crave a bowl of hot oatmeal for breakfast. That doesn’t mean that you don’t need a good breakfast. The perfect, quick, easy, and tasty way to get the satisfaction of oatmeal for breakfast, with none of the heat, is overnight oats. I prefer to make them in a mason jar as I can make a few batches and stash them in the fridge for breakfast. Another great trick is to make them in your nearly empty jar of peanut butter (or other nut butter). I’m sure that if you don’t have any jar you could still make them in a bowl; just cover with a lid of cling wrap before refrigerating. 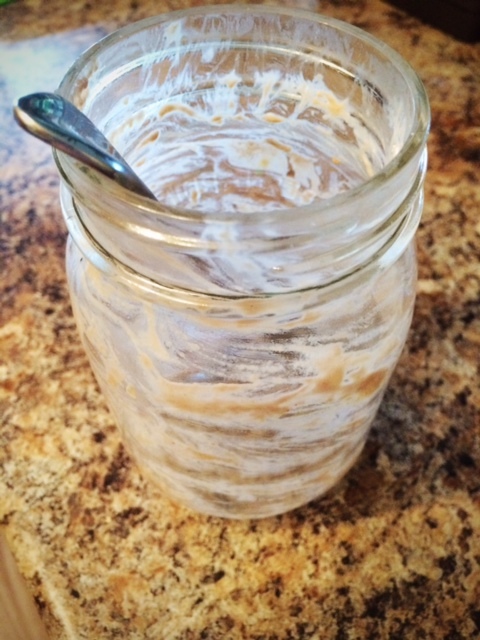 The key to overnight oats is letting them sit long enough for the oats to absorb the liquid ingredients. I like to make mine in the evening and then all I have to do in the morning is grab them out of the fridge. Make sure you mix your ingredients well, before refrigerating. This is also where a mason jar comes in handy because you can just shake it like crazy. Mix all ingredients together and refrigerate until thickened (preferably overnight). Enjoy as is. Mash the banana and PB together, put in jar with all other ingredients. Mix well. Refrigerate. Enjoy! Basically, you can combine any fruit, nuts, seeds, you desire. Although you may want to add nuts in the morning so that they don’t get mushy in the mixture overnight. Tags: cooking tips, healthy eating, overnight oats, recipes, summer breakfast | Permalink.